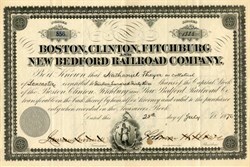 Beautiful certificate from the Boston, Clinton, Fitchburg and New Bedford Railroad Company issued in 1876. This historic document has an ornate border around it with a vignette of an indian. This item is hand signed by the Company's President and Secretary and is over 129 years old. The first railroad known as the Old Colony Railroad was incorporated April 13, 1838 to run from the end of the Taunton Branch Railroad - which ran from the Boston and Providence to Taunton - to New Bedford. This however was renamed as the New Bedford and Taunton Railroad on March 26, 1839, before construction began, and only became part of the Old Colony system in 1879, when the Old Colony leased the Boston, Clinton, Fitchburg and New Bedford Railroad into which it had been merged.